The visuals are going to end up being quite simple. I’ve got what is probably close to final gradable surface art. 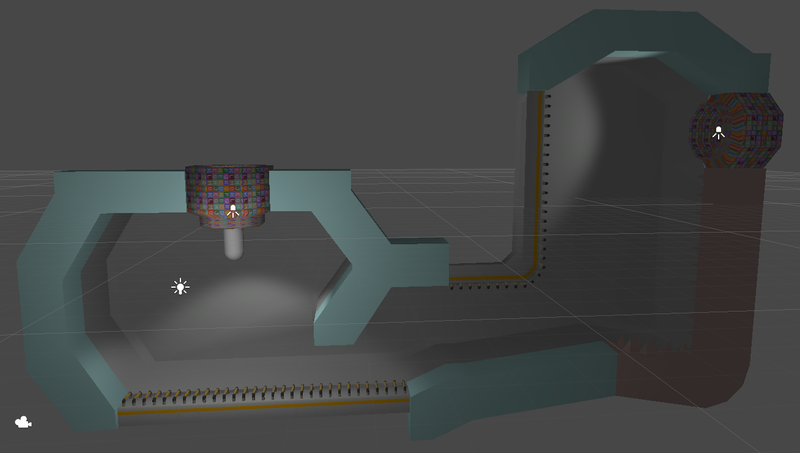 Heres a screenshot of a level mockup including it with plenty of placeholder other stuff. I’ve decided that I won’t try to model, rig, and animate a human form this month. The player will be a bouncy ball, probably with some effects to indicate state. I’m also leaving my ideas of story by the wayside, and settling for just some pure gameplay. Finally, I’m considering a new name. A game’s name should be somewhat searchable, if you stick it into google you shouldn’t get a wave of other info. Rebound has a fairly populated google result set. The chief alternative is Grab, Jump, Bounce, but I’m not super happy with it yet. This year I have decided to participate in Christer Kaitila’s One Game A Month challenge (henceforth referred to as 1GAM), which means I will be attempting to produce 12 playable games, as finished and polished as possible, within this year. A tall order, but proven possible by some already last year. So lets talk a bit about my game for January. I have started keeping a file with a list of game mechanics I want to use, and it grows pretty steadily. One of the prime candidates this month was Atomic Space Race, a sort of puzzle game building off of Orbit Toy that challenges the player to plot the fastest course through a star system that hits certain points. It’d build on the existing code and be a considerable step towards the goal of Atomic Space Navy. However, having worked on Orbit Toy pretty intensively lately and knowing that I have committed to 12 games this year, I decided to shelve that for later and find something else to focus on for January, so I skimmed my list and started sticking ideas together. The result is Rebound, a 2D game about exploring the interior of a space station in freefall. You move by grabbing and ‘climbing’ along surfaces, or by leaping and bouncing off of walls. Since settling on this idea, I’ve worked out a very rough prototype of the movement, playable at this linked page. I’m excited about this idea, but it has some large hurdles. As I’m not aware of any other games with movement like this, it’s harder to tap the collective knowledge of the internet and find known-good solutions to problems, or even to learn from past failures. More critically, this game demands some level of character animation. I’ve dabbled in character animation in the past, but never from a programmer’s perspective, nor with any of the tools currently available to me. Adding learning the tools to the burden of art production is an ominous prospect. I may be able to skimp on the art side some, but the point of 1GAM is to produce finished games, so that option can only be taken so far. This type of game can live or die on level design. I’ve no practice here. Guess I’m going to get some by the end of the month. The results of my experimentation with this will decide whether Rebound is purely an exploration game, or if I need to include enemies and combat to liven things up. Sound and music are also obstacles, but plenty of resources exist for those. I will do my best to keep this blog updated as the game progresses.